As your child’s first and most important teacher, you can be a powerful force in your child’s efforts to become a skillful reader. Whether your child is already a proficient reader, or is a struggling or reluctant reader, your positive encouragement can help them make continuous strides toward success. Here are some suggestions on how you can support reading at home. Create a quiet, special place in your home for your child to read. Keep books and reading materials readily available. 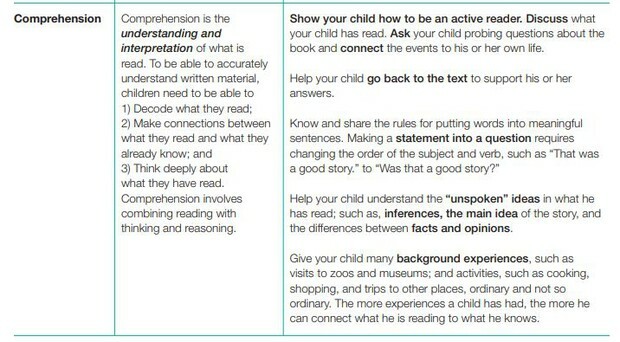 Help your child see that reading is important. Set a good example for your child by reading books, newspapers, and magazines. Talk about what you are reading. 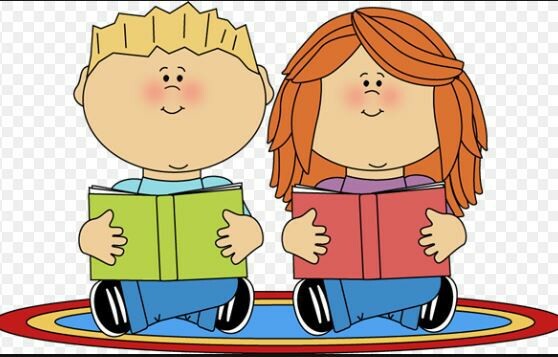 Ask your child about reading strategies he/she has learned at school. 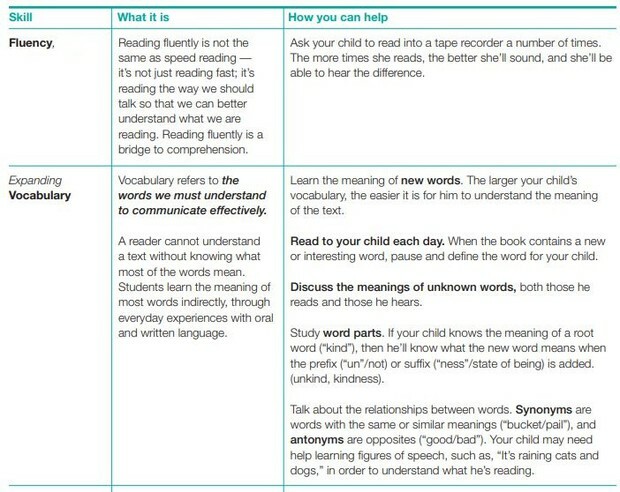 Have your child use these strategies when reading at home. Encourage your child to re-read material to get a deeper understanding of its contents. This is particularly true for non-fiction material (textbook content) and material written above grade level. Discuss the importance and approach of reading for different purposes: to entertain, to inform, to persuade, etc. Reading for different purposes helps to define the speed and depth of understanding to apply to that reading. Distinguish between skimming, scanning, speed reading, and reading for deep understanding. Help your child to understand the appropriate applications of each. Encourage “engagement strategies” such as highlighting, using post-it notes, underlining, and developing questions as your child reads. These behaviors help to habitualize the process of making-meaning and to ensure your child is doing more than reading the words on the page. Although your child should never mark in a library or school textbook, cutting post-it notes into smaller “flags” can serve a similar purpose. Write notes recognizing your child’s accomplishments. A little praise can go a long way! These are fun games that students can play while increasing their vocabulary skills. 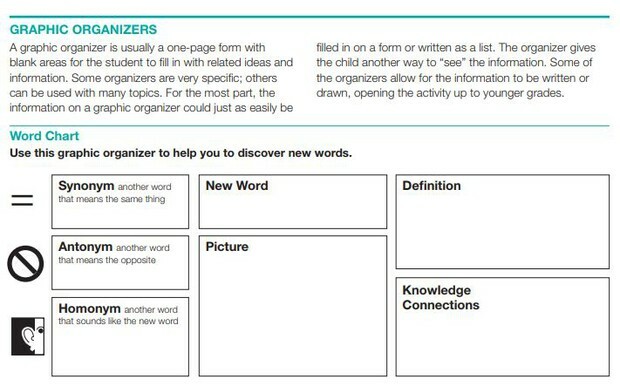 Reading Strategies that Work: These can be used for all middle school students. How to encourage your student to write! Nothing teaches parts of speech with as much laugh-out-loud joy as a good game of Mad Libs. With the Wacky Tales link at funbrain.com, students can choose from a variety of already selected words or use that list to inspire them to come up with their own descriptions. Their stories are guaranteed to be hilarious, and the activity is ideal for those students who are shy about sharing. Authonomy has 70 free ebooks under a search for Young Adult. All are available for free reading online without registration. AuthorStand has a nice sized collection of free novels and short stories in its Young Adult section. These are original works by generally unpublished authors. Available for free download in PDF. BookRix has almost 1000 free ebooks in its Juvenile fiction category. These are available for free download in EPUB or for free reading online. Booksie has over 13,000 works in its young adult category. These range from short stories to novels and are unique works of unpublished authors. All are available for free reading online or free download in PDF (press "Generate eBook" button). Classicly has almost 1800 free novels in its Young Adults collection. 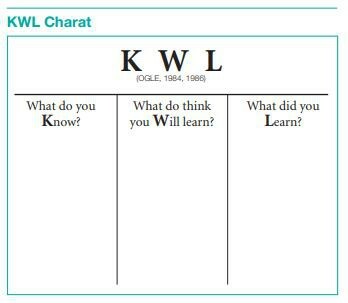 These are available for free download in PDF or Kindle (AZW). ClovisNews offers about 100 free classic novels for free reading online (the download links all appear to be dead). eBooksInternational has 7 free classic novels in its Young Adults category available for free download in PDF. FreeOnlineNovels has around 200 free novels in its Young Adult category. These appear to be original books from unpublished authors. All are available for free reading online and some for free download in PDF. GoodReads has a listing of 95 free young adult ebooks. All are available for download at their site. ManyBooks (Young Readers) 2443 free classic books available for online viewing or download in an extremely large variety of formats. Read.gov has 6 classic novels for teens available for free reading online or free download in PDF.